319 pages | 140 B/W Illus. 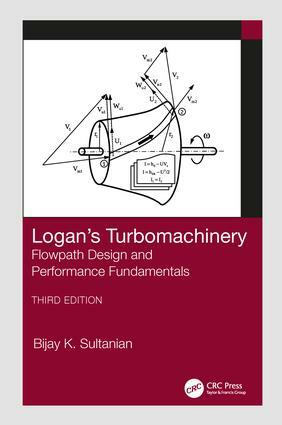 Logan's Turbomachinery: Flowpath Design and Performance Fundamentals, Third Edition is the long-awaited revision of this classic textbook, thoroughly updated by Dr. Bijay Sultanian. While the basic concepts remain constant, turbomachinery design has advanced since the Second Edition was published in 1993. Airfoils in modern turbomachines feature three-dimensional geometries, Computational Fluid Mechanics (CFD) has become a standard design tool, and major advances have been made in the materials and manufacturing technologies that affect turbomachinery design. The new edition adresses these trends to best serve today's students, and design engineers working in turbomachinery industries. Dr. Bijay (BJ) K. Sultanian is a recognized international authority in thermofluids and computational fluid dynamics (CFD). He is the founder and managing member of Takaniki Communications, LLC, and an adjunct professor at the University of Central Florida, where he teaches graduate-level courses in turbomachinery and fluid mechanics. For nearly half of his 40+ year career, he worked at GE and Siemens. Sultanian received his BSME from IIT Kanpur and MSME from IIT Madras. He received his PhD in mechanical engineering from Arizona State University, Tempe, and MBA from the Lally School of Management and Technology at Rensselaer Polytechnic Institute.